The letter, which is dated today and appears on Twitter, did not say whether WCM777 would provide defense lawyers for any arrestees or subjects of investigations in Peru. WCM777, an arm of World Capital Market, is under investigation in multiple countries. In November 2013, the firm was accused by the state of Massachusetts of selling unregistered securities. Hotel presentations in Massachusetts allegedly were targeted at Brazilian-Americans. In the United States and elsewhere, claims have appeared that $14,000 sent to WCM777 returns $500,000 in a year. 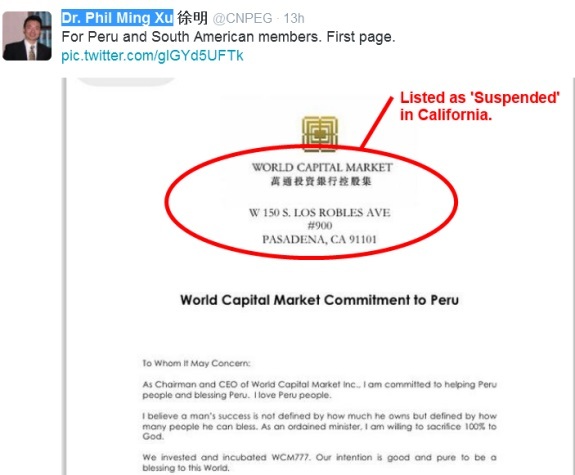 The Ming Xu letter to Peruvians claimed the company “is willing to back” the 130 percent scheme, but appears to ignore the issue of offering unregistered securities. WCM777, now reportedly known as Kingdom777, has been targeted at people of faith in the United States and other countries. Some people believe the world will end in April. It’s unclear if Ming Xu is in the end-of-the-world camp. I dont know why peaple is talking bad about kingdom777 i have made $12000.00 in three month with $6000.00 investment. TEA LEAVES: AdSurfDaily Case About To Come To A Head?